When event planners come to us looking for an all-in-one solution to streamline their conferences, they are often looking for event check-in ideas to expedite the process. 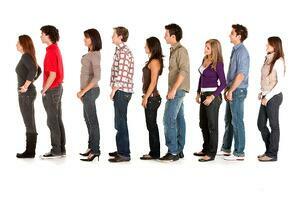 The traditional check-in and registration process can be tedious, time-consuming, and frustrating. You’ve probably been there: you stand in a long line, wait for 20 minutes, then when you approach the check-in desk, an event staff member searches for your name on a list ten pages long. Once your name has been found, you receive your badge and registration materials and are on your way to breakfast. You put on your lanyard, look at your badge, and realize your name is spelled wrong. You go back to the desk and ask for a new badge, wait another ten minutes for a re-print with the corrected information, and now that you’re finally all set, you have to scarf down your breakfast to make it to the opening session on time. ♦ Attendees can make changes as needed (for example, they can edit their first name if they prefer to go by a nickname). As the meeting planner, you can control exactly which fields attendees are able to revise. In addition to simply checking in attendees, you can also use registration data to serve up important messages or reminders on the kiosk. For example, if an attendee hasn’t downloaded the app, you can remind them to do so. This message will only be shown if it is relevant to the individual attendee. Or, if they haven’t registered for their breakout sessions or answered their networking questions in advance, you can remind them to complete these activities or even offer the opportunity to do so onscreen. Again, these messages will only appear for attendees to whom the message applies. This level of customization is one major benefit of the kiosk solution, but the rewards don’t stop there. You can use the kiosk as a walk-in registration system as well. Just let your account manager know all the fields you need attendees to fill out, and the registration process will be built into the kiosk. 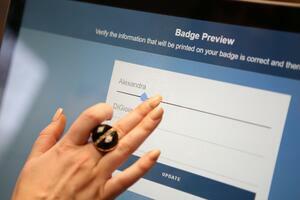 Once walk-in attendees enter their information, they are routed to a screen to confirm the data and print their badges. Speaking of registration, MeetingPlay is able to integrate with any system, so data is seamlessly delivered from your event registration platform to the app’s database. We can even set up a two-way feed so that any changes made or new attendee records created on-site are sent back to the registration system. This way, you have all the data you need in one place at the end of the event. 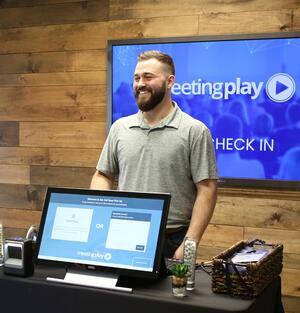 If this system sounds great, but you’re not sure how to handle it all, not to worry – MeetingPlay’s experienced onsite event staff has you covered. Our travel directors will manage the check-in process for you, from setting up and maintaining the equipment to helping keep lines moving. If decreased wait time, customized experiences, and even eliminating paper waste from no-show attendee badges are part of your onsite wish list, the MeetingPlay kiosk solution may be just what you need. Let us help you refine your check-in and registration process. Looking for more registration ideas for events or event check-in tips? Contact us today to find out how we can help.